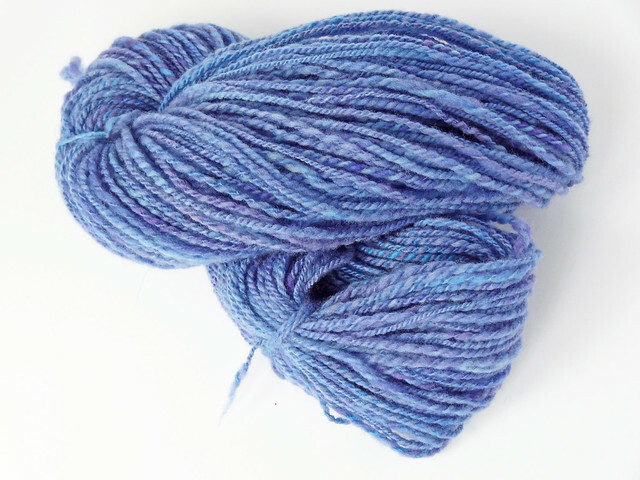 Last week, I wanted to talk about the lovely new yarn I had made. It was blue and fluffy and gorgeous. The only trouble with this plan was the lack of cooperative levels of sunlight. However, since that miserable grey day, we have had a glimmering of sunshine and I got my camera out, quick sharp. But before I get carried away, I should start at the beginning, with the fibre. 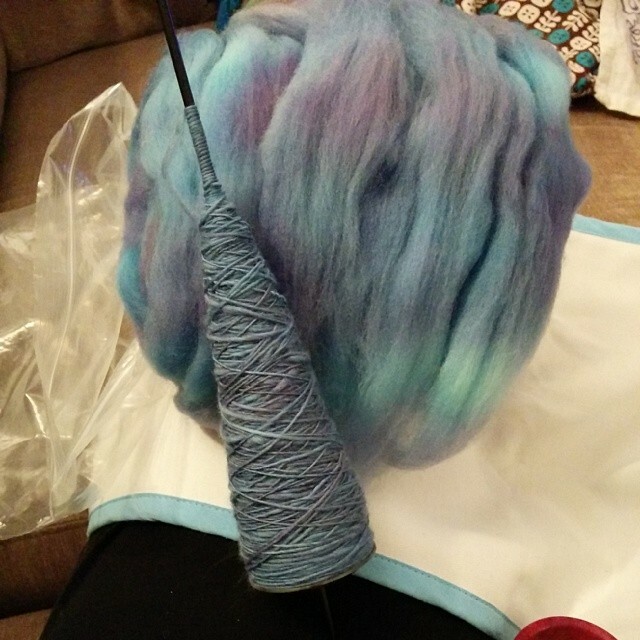 This fibre was Polwarth in a lovely blue with hints of purple, dyed by the lovely Countess Ablaze. I swear I should get a sponsorship deal from this woman! This project was great fun as the fibre was prepared beautifully and Polwarth seems to enjoy being spun long-draw. The fibre was prepared as combed top, so I spun from the fold and the more I spun, the more the motions became embedded as muscle memory. I think another couple of braids and it will be stuck permanently. As the singles, I spun, were so fluffy I decided to only create a 2-ply yarn, as I wanted a reasonable meterage. I would the singles around two plying balls and then plied them on the same spindle the singles were created on. As this was one of my first full skeins of spinning long-draw there is quite a lot of uneven places in the yarn, but it a much lighter and fluffy skein, than my last attempt at long-draw spinning. I really don't mind the uneven yarn because it is incredibly soft and light. I soaked the yarn and gave it a whack against the bathroom tiles then left it to hang until dry. The finished skein weighs 97g and is approximately a worsted weight yarn and is 165m/180yds in length, which is more than enough to make something light and warm. I am delighted with this yarn, first because it is pretty yarn and second because it was spun long-draw and I actually enjoyed the process! This is a first and I can finally see what all the fuss is about, it's such a fun technique.